Cotton canvas is woven by cotton fibers both in warp and in weft, its elongation is relatively low, it is good in mechanical fastening adhesion with rubber. Cotton conveyor belt has relatively small deformation under high temperature conditions, suitable for short-distance and light-load transportation of materials. Polyester cotton conveyor belt is the upgraded product of cotton conveyor belt, and its tension resistant body is woven by polyester cotton fibers in warp and cotton fibers in weft. Its comprehensive physical and characteristics are obviously better than those or cotton conveyor belt, especially the belt body is thinner ad lighter the belt has better shock resistance and thus the belt has better use function and can reduce energy and material consumption for users. It is the ideal selection for medium, short-distance and medium-load transportation of materials. 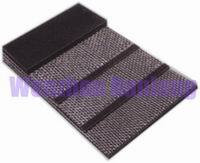 Specification and technical data of multiply cotton, polyester cotton conveyor belt.